This mini skirt is a very easy and quickly project. Uses a double crochet stitch for every round. Made in baby alpaca fiber. 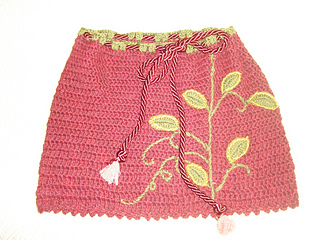 Detailed with embroidery branches and applique crocheted leaves. It gives an extra warm, and comfort for the chilly days. Superwash Merino Wool; 123 yds 50 gm: # 24057 Moss, 1 ball; #26061 Honey, 1 ball. Size USH8 (5.00 mm) crochet hook. about 1” (2 cm) wide, and 1 ½ yards (1.25 m).